During these sleepless nights and long days of caring for your adorable baby, it’s sometimes hard to remember that this cute little bundle will all-to-soon grow into an adult. We don’t think too much about it, but consider how much your baby’s jaw and teeth and gums change between birth and adulthood! We start with a mouth full of gums and begin sprouting teeth within a few months. A few years later, we lose those teeth, only to be replaced by a brand new set … not to mention how drastically our jaws change during these formative years. The growth is astounding. Our bodies are indeed miraculous. Don’t give your baby sugars. It’s bad for health overall and especially for oral health. The bacteria in our bodies love sugar. 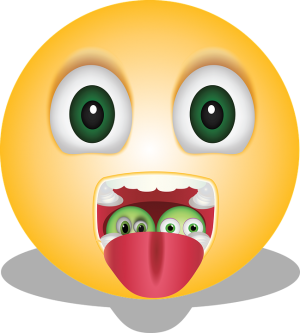 And, as you know from other posts on this blog, when the bacteria in the mouth multiply, a byproduct is acid. The acid erodes tooth enamel and that is followed by decay (cavities). No sugary snacks. No sugary drinks, in general. Especially be diligent to never, ever give *anything* (breastmilk, formula, juice, etc.) in a bottle immediately before or during sleep. Give your baby a gift and practice oral hygiene now, no matter how small he or she is. If oral hygiene is just a normal part of life, your babies will grow up naturally taking care of their gums, teeth, and tongue and will get the payoff of a beautiful smile. Even before there are visible teeth, you can clean your baby’s gums with a clean, wet cloth after each feeding (brush after eating). Once there are some teeth, begin using a tiny, very soft brush after each meal. 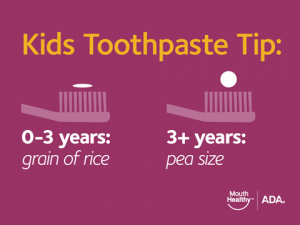 Don’t use more than the equivalent of a grain of rice of toothpaste. Turning 1 year old is an important milestone. 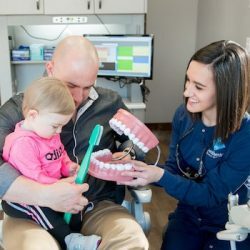 Mark it by taking your baby to his first dental appointment! Again, this sets up a habit of taking care of teeth and it also provides the opportunity for the dentist to detect problems early. You may think that we already addressed this topic in the “Don’t wait to start oral hygiene” section, but you’re wrong. This encouragement is for YOU! You strive to be a good example for your children. Let that intention extend into involving them in your own oral hygiene from day one. Take your baby into the bathroom with you when you brush your teeth. Make a point of brushing after meals … and take your baby along, always explaining about the importance of cleaning your teeth after eating. Make a game of it – Smile in the mirror with your baby, have fun and enjoy these precious months! 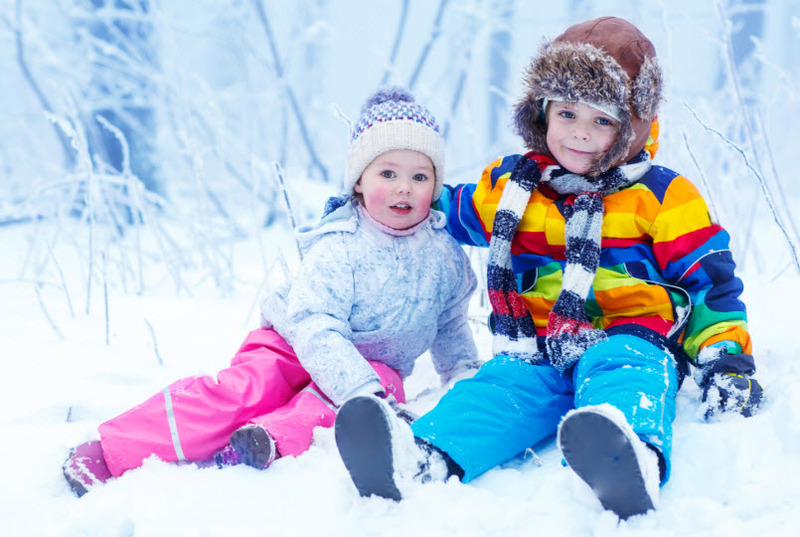 The days are shorter, temperatures are colder, and energy levels in children can drop during the winter months. Many people, including children, may overeat during this season, and it is for this reason that it is important to keep vigilant with nutrition needs. The following foods will help keep children and adults happy and healthy, during cold the weather months. Clementines are cute little oranges packed with fiber and much needed Vitamin C. In addition, they also have magnesium, potassium, and calcium, which are important for growing bones and muscles. Not only are these little gems seedless, but they are easy to peel and fun to eat. You will get 25 or more in a box (they will disappear faster than you can image), and in addition, each one has only 25 calories. They are the perfect wintertime snack, and a great addition to any lunchtime meal. An amazing sweet treat will be segments of a clementine topped with Greek yogurt and a drizzle of caramel sauce. Another great idea is to add the bright-colored sections of this orange to salad and steamed broccoli, to make these greens more appetizing. Sweet Potatoes are delicious and packed with fiber, potassium, and Vitamin A. The sweet mild taste of this great potato means that it will work in a variety of recipes. For instance, it can be used with macaroni and cheese, and even added to oatmeal or brownie mixes. As an alternative to frying, they can be sliced into “coins” or long strips and baked with some olive oil. Salmon is a great food option to beat the winter blues, because it is full of Omega-3 fatty acids, which have been documented to manage feelings of depression. Making kebabs with vegetables is a fun way to enjoy this delicious and healthy protein. Also, try your hand at making salmon cakes mixed with corn and rice. By the way, who says that pot pie needs to be chicken? Try a salmon pot pie. The entire family will love it. Winter Squash is naturally sweet, and it doesn’t get the praise it deserves. Roasted butternut squash is a delicious sweet treat, when topped with maple syrup and cinnamon, and then baked to perfection. Try it! The kids will love it. Spaghetti squash is another underrated food that can be mixed with your favorite pasta sauce. Cauliflower on the other hand is very popular these days. Cauliflower is delicious all by itself; however, it is very versatile, as it can be “riced” and used in a variety of recipes, such as fried rice. It can be mashed just like potatoes, to be a wonderful side to any meat dish. It can also be transformed into a pizza crust, and who doesn’t love pizza. The ideas are endless! In addition to tasting great and being a versatile vegetable, it is rich in Vitamins A, B, C, and K. Cauliflower contains potassium, manganese, and magnesium, which are all necessary for growth and development for young bodies and minds. Summer months bring sunshine, days at the beach, BBQs, and kid’s home from school. The grocery shopping, that is usually done when children are not around, now becomes a challenge, if children need to accompany you on this errand. Sometimes this necessary chore is boring to adults, so it only seems natural, that small children would get bored very quickly and only find entertainment in knocking things off the shelves. Below are some fun and educational ideas that may keep your child entertained while shopping for groceries. As previously mentioned, children are curious, and love to touch and grab items. Instead of an absolute “NO”, instill in your child, the “one finger rule”. Have a child choose one finger only, and if they feel the need to touch something gently, it can only be with the one finger they chose at the beginning of the game. Many children want to push the cart, because they may not know that they can be the “Captain of the Cart”. By keeping your child safe “in the cart”, they will feel in control, and you can use this opportunity to teach them right from left, colors, and shapes. You can even play a mini-game of “red light – green light”, as the cart stops and moves from each location. Bingo has been around for generations, but “grocery store Bingo” is a new twist on a long-loved game. There are free pre-printed cards available online or you can create a board of your own to keep children busy. “I Spy” is another great classic game, and a grocery store is the perfect place to play, because it is filled with colors and different shaped items in every aisle. For instance, ask children to “spy” something red and round; such as an apple, or ask them to point out something that starts with the letter “R” such as rice. It doesn’t have to be all fun and games; in fact, grocery shopping is a great way to re-inforce math skills, and to begin teaching financial budgeting. For instance, there are usually scales in the produce section, and you can ask children to guess how much a certain item will weigh. This will get their minds thinking about the size and weight of items, as well as the cost. As each item is placed in the basket, have children add the price on a calculator. If something goes over budget, think it through together, and decide what items need to be put back on the shelf. 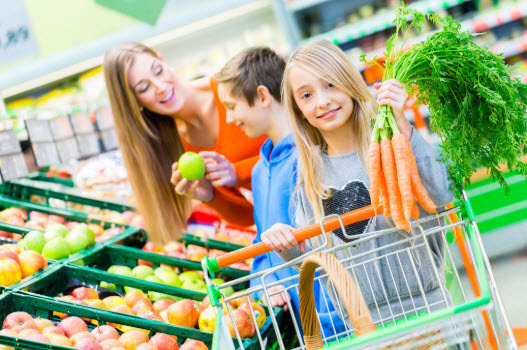 Now that we see that grocery shopping with your kids can be fun and educational, go ahead and head out to the local market with the up and coming generation. If you are a parent, then you know that training children to brush and floss their teeth can present all sorts of challenges! It is no easy task to master for little hands and fingers still fine-tuning motor skills and anxious to move onto the next activity within 30 seconds of starting one. Regardless, it is important for them to begin development of healthy habits that will serve them well throughout their lives. That doesn’t mean it can’t be fun with a few little tweaks to the game! Children tend to learn visually and audibly as they get to know the world and objects around them. Using an activity to demonstrate how a task is done not only gives them something enjoyable to do, but it can also help them translate the action into personal life skills. Try a fun approach with these little activities which will give kids a visual, hands on skill-building experience. Those tiny little hard-plastic figurines you often find yourself stepping on can prove useful for this activity! By using toothpaste rather than soap, you can keep this activity closely relateable for your kids in regards to their own teeth. Encourage them also to work within a defined space such as on a plate, tray, or place mat which will help refine motor skills. The goal here is to follow the same steps with the toy as you would to instruct your kids to brush their teeth. Let the kids scrub away! While they are brushing, discuss why they are cleaning their toys and point out any stubborn bits that need a little extra scrubbing. Encourage them to check that all little crevices are clear before rinsing and drying. 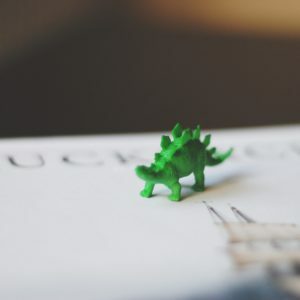 Create a positive experience to draw from by even referring to their teeth as little “dinosaurs” (or whatever it is you used for this activity) and ask if they thoroughly scrubbed them clean! Help or allow your child to put the dough between the bock pegs. Demonstrate the proper flossing technique and leave them to it! As with the brushing activity, discuss the importance of flossing and what happens when plaque (or playdough) is left between the teeth. You can even leave the block out to dry overnight to similarly show your child what happens when plaque remains between the teeth. Not such an easy mess to remove then! Having your child scoop out the play dough from between the pegs is also a great motor skill development activity. This particular activity emphasizes the importance of shaping the floss around the tooth to ensure no little bits of “plaque” are left behind. Rainy days are not much fun, especially when the kids are home from school. We have the solution to keep the day fun and entertaining, even if the weather outside is not ideal. Of course, this is a great time to pull out the puzzles, board games, and a deck of cards for family fun, but for something a little more interesting, try some of these suggestions. You may find that soon your home is the place to be on a rainy day. Stir the first 5 ingredients together, in a 2-quart saucepan over low to medium heat. Add food coloring once it begins to thicken. Continue stirring until the mixture is very thick and begins to gather around your spoon. 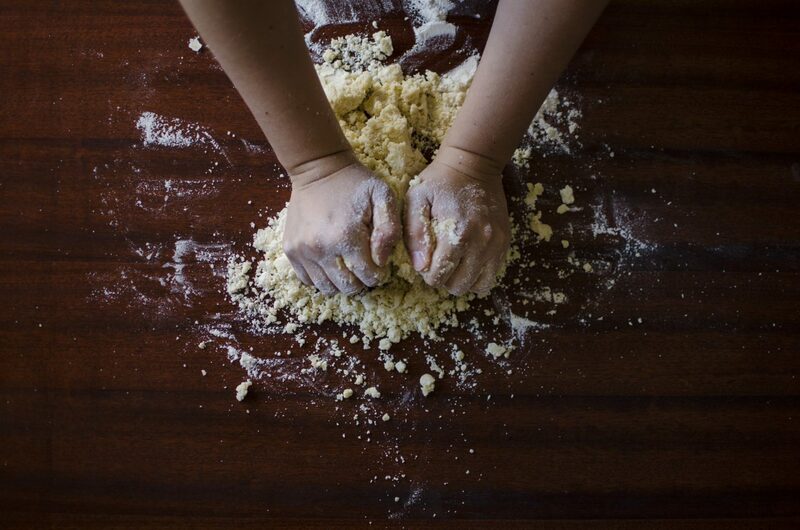 Remove dough from pan, place on wax paper or a plate until cooled. Enjoy! Once completed, store in a sealed container or sealable plastic bag for next play time. Find some older socks and items to create eyes, mouth and noses (buttons for example). Items can be sewn or glued to the socks. Create of “Puppet Theater” from a cardboard box, and let the imagination of children run wild. Remember to record this memory. To create a DRUM, you will need an empty oatmeal container (with cover), a pen, 2 pencils, 2 spools, yarn, crayons, and construction paper. For a more dramatic and colorful instrument, the oatmeal contain can be decorated with crayons and the construction paper. Using the pen, poke a hole in the center of the cover and the center of the bottom of the container. Pull a piece of yarn through these holes (long enough to hang around the child’s neck and down to their waist). Place to spools at the end of the two pencils (secure with glue) to be used as drumsticks. Beat, to play this homemade instrument. A basic HORN instrument is created by using a paper towel roll, a rubber band, pen, and some waxed paper. Cover one end of the roll with waxed paper (secure with rubber band), and punch holes along the roll with the pen. To use, sing into the open end of the horn. To create a COMB BUZZER, you will need an ordinary pocket comb and some tissue paper. Simply fold the paper over the tooth edge of the comb and hum through the paper to make music. This is a great way to have fun and have the kids (and adults) be awe-struck by the wonders of science. 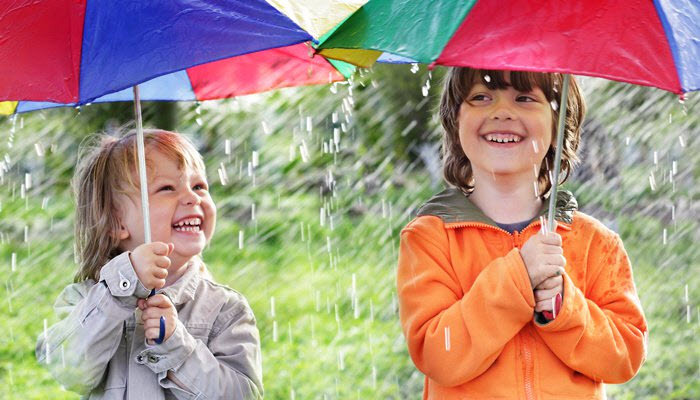 Here are some simple science experiments to do at home on a rainy day. First of all, since it is a rainy day, measure the rainfall, by putting a large jar in the rain. On an hourly basis, measure the height of the water and record the findings. Another great experiment is turning shiny new pennies green. For this experiment, you will need some copper pennies, white vinegar, a bowl and some paper towels. Mold the paper towels to the bowl, put the pennies on top, pour the vinegar over the pennies until saturated, and watch the chemical reaction occur. Also, try fishing for ice. For this experiment, you will need a cup of water, a few ice cubes, table salt, and piece of string. Put the ice into the water and they will float to the top, using the string try to “fish” for a piece of ice. At this point, nothing will be caught. Now, sprinkle some salt on the ice, wait a minute, then try “fishing” again with the string and see what you caught! Be sure to schedule an appointment for your child’s next checkup or other dental needs. Easter is the biggest holiday of the spring with so many children eager to dive into the fun. However with all the excitement and tradition of Easter, there is the downside of the amount of candy consumed. Easter is definitely a holiday that has morphed into a day of sugar and treats. As a parent, this can be a bit worrisome if you’re concerned for your children’s dental health. There are some good tricks though that can still give your kids fun surprises but cut down on the amount of sugar consumed. Sugar-free gums which use zylitol or any other alcohol sugar, are excellent alternatives to still give your children something sweet to chew on but without the high sugar content. Alcohol sugars don’t cling to the teeth as regular sugars do and are not loved by the bacteria in the mouth. Stickers are also always a favorite with kids. Its easy to find stickers with your child’s favorite Disney character or superhero that they will easily love just as much or even more than a piece of hubba bubba. Trailmix with yummy nuts and some semi-sweet or dark chocolate chips will significantly cut down on the amount of sugar found in a regular amount of m&ms but is still a yummy treat! Play dough is a super fun alternative as well. I don’t think there is a child out there who doesn’t like play dough! Pick dough in your child’s favorite color and they will be entertained for a much longer time than if you gave them jelly beans. Baking some treats with half the sugar or alternative ingredients is always a healthier option than anything you would buy at the store. Baking with date sugar, coconut sugar or maple sugar can be some good alternatives that are still sweet but not hard on the teeth like cane sugar! Creating coupons is always a fun way to make Easter baskets more interactive. Having a coupon for a trip to the movies, a local arcade, a theme park or just a fun outing with mom and dad can be a great idea. Kids love going on adventures more than getting piles of sugar to eat. Mostly all kids love getting and eating candy. As a parent it can be very easy to want to give into these wishes but I think most kids would agree that is given some of these fun Easter basket alternatives, they would choose them any day over a bag of candy! 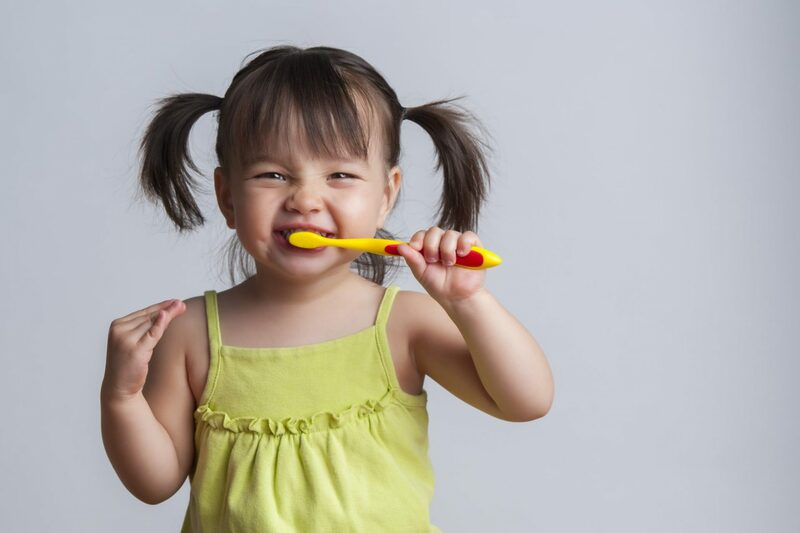 Easing into a tooth-brushing routine can often be a difficult process with young children. The magic of being a “big kid who brushes their teeth” doesn’t last for very long, eventually making the repetitive routine of teeth brushing a bit painful. There are always some tips and tricks however, which can make this adjustment process much simpler! Let your kids practice by letting them brush your teeth. This can be a promising solution because it allows them to feel like you are in this process with them and not just the tooth-brushing dictator. A reward system can also be effective. Add stickers to a calendar or quarters to a jar or maybe a fun game before bed. This helps give the child incentive and makes them feel like they are doing something right by brushing their teeth. (Just don’t make it candy or chocolate on a daily basis, as this is semi-counter intuitive to purpose of brushing teeth! Changing toothpaste can also be effective by adding a new flavor and helping it feel like a new experience. Sometimes even making toothpaste optional at first, can make the initial experience a bit less dramatic. Giving independence. Allowing your child to put on his or her own toothpaste and do a lot of the brushing themselves as well as rinse out their own mouth can help them feel responsible and in control. Brushing to music makes tooth brushing into more of a party or game, which can help break up the monotony of the routine. Use an Analog timer. These timers are a fun visual for children and can help give them a 3D image to watch as well as know how long they need to brush. Brushing teeth is never an easy task at the beginning, but hopefully these six simple tips help you better negotiate with your reluctant brushers! There’s no question – The New year’s resolutions we set for ourselves can be overdone, cliche, and downright unrealistic. But there’s a reason we invest time and money in our resolutions. We know somewhere inside our own mentality that if we have some financial or practical incentive to meet our aspirations (other than just sheer willpower), we will be more likely to complete these goals, or at the very least, not regret setting them. So we’ve compiled a list of ideas that you as a family can make together that are no “down payment”, commitment-free, resentment-free and can be great ways for you all to bond closer together in 2018. These are more of ideas than set-in-stone goals; giving you and your family the opportunity to try them out and whether or not they should come to be new rituals in the coming year. So if you try any of these and fail, there’s no guilt. The most important thing, however, is to keep track of the resolutions you have completed. This will make you and your household feel more accomplished. Have a “good things” jar. Keep it in a visible place that doesn’t blend in with everyday clutter but adds to the aesthetic of your home. Keep it by the front door or television so that it is always in sight. Next to it, place a stack of small strips of paper along with a pen or two. Whenever a milestone is reached, small or big, personal or collectively, remind one another to write them down and put it in the jar. Did dad get a promotion? Did Johnny score his first soccer goal? Did Sarah lose a tooth? Was a new cousin or niece or nephew born? Keep track of all the good events, and on December 31st, 2018, open the jar and read about all the amazing things that happened throughout the year. Choose a day this year (sometime in May or June is usually a good time – school is slowing down for the summer) and play hooky from school and work! Go to a movie, out to lunch, and just have some quality time. Sometimes it feels really good to break the monotony of a tedious daily routine and cut loose. 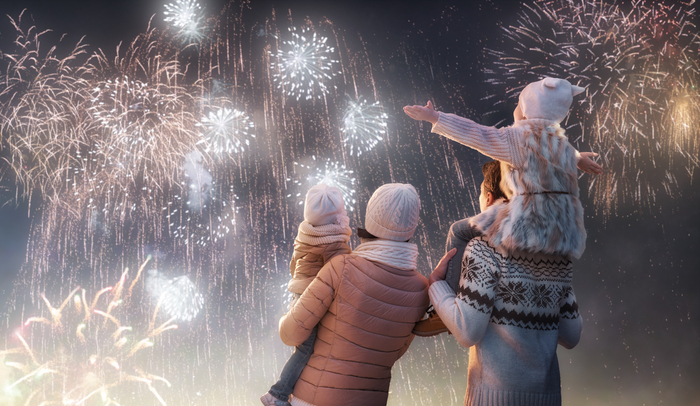 If it’s a hit – and we’re confident it will be) – make it a yearly ritual! Start a weekly tradition. Choose an evening that works for everyone’s schedule and have a movie night, a game night, a craft night or a night out! If you find it hard to keep consistent, keep it on your calendar, and find the “thing” everyone doesn’t have difficulty committing to. As the years go by, we’re becoming more and more dependent and addicted to technology. Make a conscious effort this year to not check devices during mealtimes. If it helps, put a sign up on the refrigerator or in a place that’s visible from the table to act as a reminder. This will force you to have more genuine interaction and will inevitably bring you closer together! Set a goal to visit a place you’ve never been. Whether its a short road trip off the beaten path, or an airplane across the country – go see it! Travel! Depending on if your kids are older or younger you can personalize the trip, and it will give you all a chance to bond and make memories to last a lifetime. Traveling with small children especially is not easy, so sometimes even making a short trip to visit family is well worth it for relatives who do not get to see them very often. We hope that you adopt one or more of these ideas into your upcoming year, or they at least gave you some inspiration to set some attainable goals. 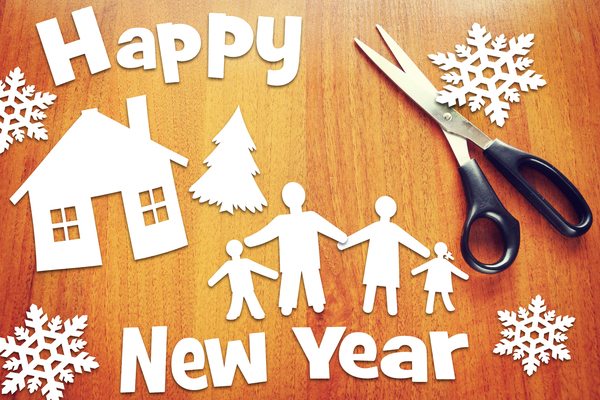 May you draw closer with your spouse and children and grow together as a family unit this year. Cheers to 2018! The general concept of Christmas is quite universal. It most often has to do with Santa Claus, gift giving, spending time with family and spreading joy. However, around the globe Santa is called by many different names, has many faces and is accompanied by a multitude of different traditions. 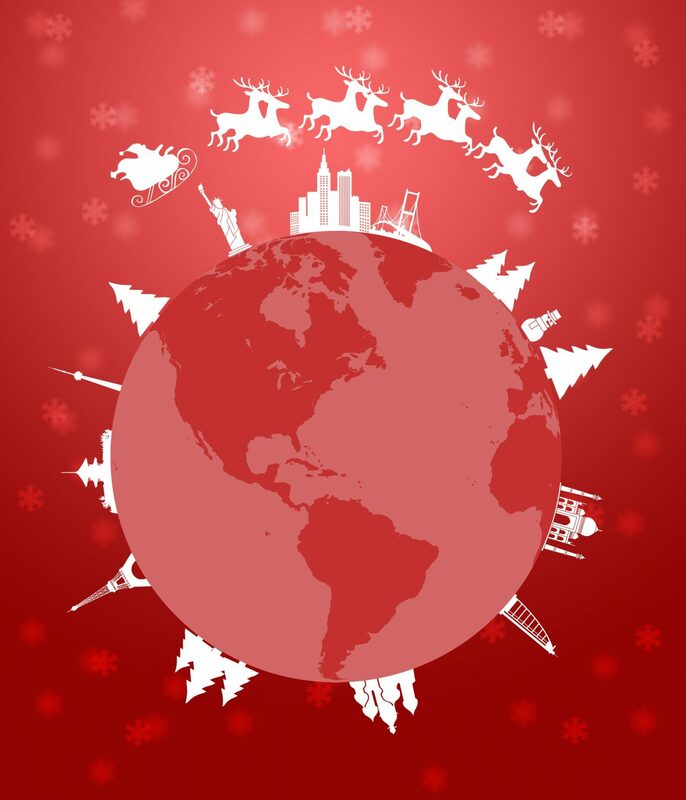 Exploring each countries distinct Christmas celebrations can be a fun way to engage with the world and perhaps give you new Christmas Traditions to explore. Christmas in Germany is a very cozy time of year. The country is known for its numerous Christmas Markets or Christkindlmarkts . Every major city in Germany will have a Christmas Market which is filled with small vendors selling schnitzel, schweinebraten or glüwein (hot wine). They also sell lovely handmade goods from slippers, to woodcarvings, ceramics or hats, scarves and gloves. Santa Claus is called the Weinachtsmann and he is responsible for bringing the Christmas presents which typically come on December 24th not the 25th. There is also someone called the Christkindl, which is not the “Christ child” but is more a Christ-like representation who typically comes in the form of a female angel. The Christkindl is a very popular face of Christmas and in some households, it is responsible for the giving of gifts. The advent calendar is also a very important German tradition. The nativity is very popular in France around Christmas as most of the French population identify with the Catholic traditions. You can wish a simple Merry Christmas by saying “Joyeux Noël!” and Santa Claus is called ‘Pere Noël”. Yule logs typically made out of cherry wood are also a popular Christmas tradition and are burned with splashed of red wine to bring out a nice smell. Christmas dinner is normally eaten late on December 24th and presents await from Pere noel on the 25th. Christmas is a new holiday in Japan and has only begun to be celebrated recently due to the spread of western world traditions. Christmas eve is much more celebrated than Christmas day and is typically thought of as a day for lovers, much like the Valentines tradition. They have taken on eating fried chicken as the preferred Christmas dish followed by a sponge cake with whipped cream and strawberries. Merry Christmas in Japan is Meri Kurisimasu! Santa is called Santa San or Mister Santa and is typically responsible for the bringing of gifts. The nativity is also very popular in Brazil around Christmas time. Due to the fact Brazil was ruled by Portugal for many years, the religious practices between the two countries are very much the same. Going to a midnight mass service on Christmas Eve is very a very common tradition! Children often will leave a sock near the window in hopes that Santa or Papai Noel will find it and exchange the sock for a present. Since it is summer time in Brazil at Christmas time, going to the beach Christmas day is a popular activity. They also have something called the 13th Salary, which comes in December, meaning that everyone makes double the salary that month! This is intended to boost the economy and gift buying for the holidays. The world is a vast place filled with a myriad of Christmas traditions. Exploring the traditions of countries you have visited, dream of visiting or are just curious about can help give your Christmas’ new perspective and meaning! Halloween is a beloved holiday celebrated by most American children around the country. What kid doesn’t like getting free candy? And in copious amounts that will last them for weeks or even months to come? Some parents opt for more family-friendly traditions, such as harvest festivals, or a celebratory gathering where there are other children. Some families decide not to celebrate at all, as many religions highly discourage parents from letting their children participate in a holiday with known Wiccan roots. 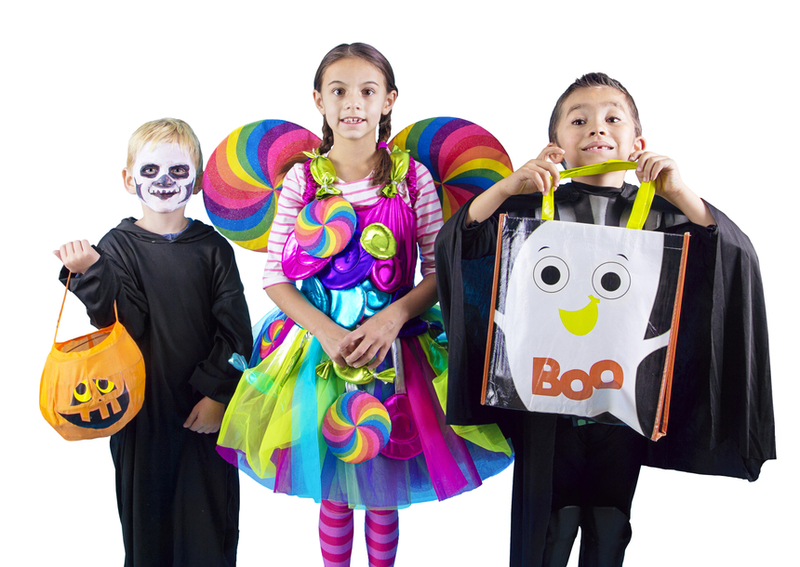 However, if you are in the majority, Trick-or-Treating is the go-to practice for millions of children and young adults every October 31st. Up until a certain age, children should obviously be supervised while they go door-to-door at night approaching stranger’s houses. But once they reach an appropriate age (TBD by each parent’s discretion) it is best that kids travel in groups. This may seem like a no-brainer, but many times young preteens and young teens can get caught up in sugar-fueled excitement that they may lose track of their surroundings, and, one or some of their group. Remind your child to keep an eye on everybody he or she is with. The buddy system goes all ways – everyone watches out for each other. If someone gets lost or accidentally left behind, agree to have a designated meeting place that is open, and well-lit – such as under a streetlight in a park or a location close to the starting point. Thankfully we live in a more technologically-savvy culture, so sending phones along in case of a problem is also a good idea. This is a great tip especially if you have more than one child or more children are coming with you around the neighborhood. Not only will this help a child navigate sidewalks and spot low-hanging branches, but it will aid the parents or the adult supervising in spotting where they are at all times. If children are unaccompanied by an adult or older sibling, this should also aid their group in staying together and being aware of each other at all times. Unfortunately, not everybody can be trusted. 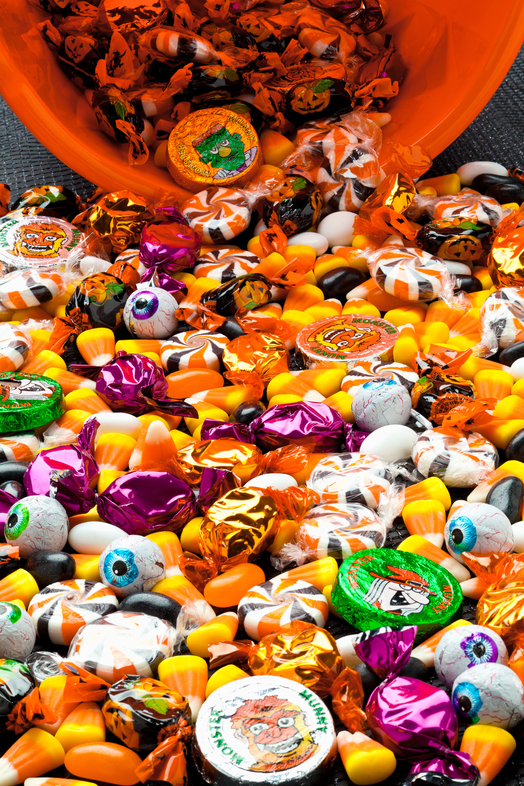 When your child has finished Trick-or-Treating, regardless of age, have them pour out their candy into a pile. It is important that the stash be examined for any kind of obvious tampering, such as an opened wrapper; in which case the piece should be tossed out. While a lot of times this is accidental, it is good to use precaution. If you find a sweet that is not in commercial packaging or appears to be homemade, unless you trust the person from whose house it came, THROW IT AWAY. Homemade candy is not really acceptable in this day in age, and for obvious reasons. With food allergies, make sure upon reading the ingredients that the food is not anywhere in the candy. In cases of incredibly sensitive peanut allergies, many times the label will tell you whether or not the treat was manufactured in an environment where peanuts were present. This is good information, especially if your child cannot even be near peanuts without have some sort of reaction. It is best that children do not eat candy while going door-to-door – especially for smaller children, as this can pose a choking hazard. Instead, send your child out after dinner or make sure they have a snack in their stomach before they head out. This way, kids will not be as tempted to begin eating any of the candy until after it has been inspected.